The ceremony marks the 68th anniversary of the founding of the People's Republic of China. A national flag-raising ceremony is held at the Tian'anmen Square in Beijing, capital of China, October 1, 2017. 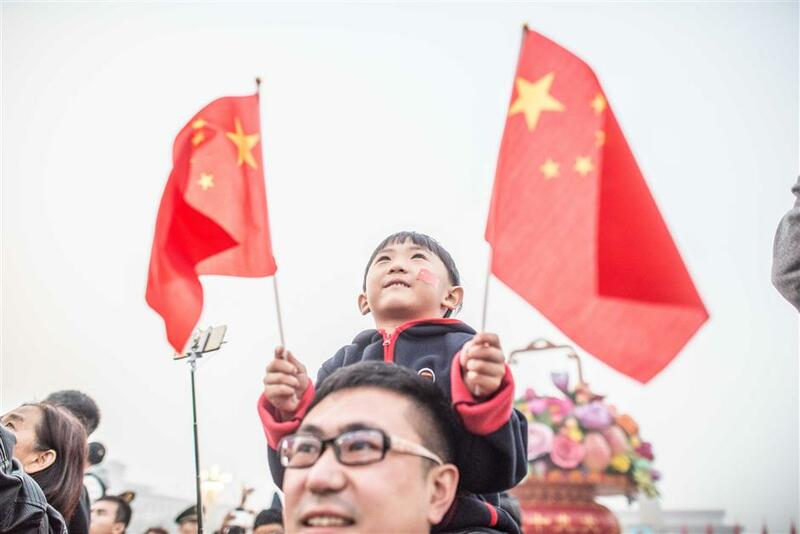 More than 100,000 people from across the country gathered at the square to watch the national flag-raising ceremony on the morning, marking the 68th anniversary of the founding of the People's Republic of China. At day break, more than 115,000 people from across China gathered at the Tian'anmen Square at the heart of Beijing to watch the raising of the National Flag. 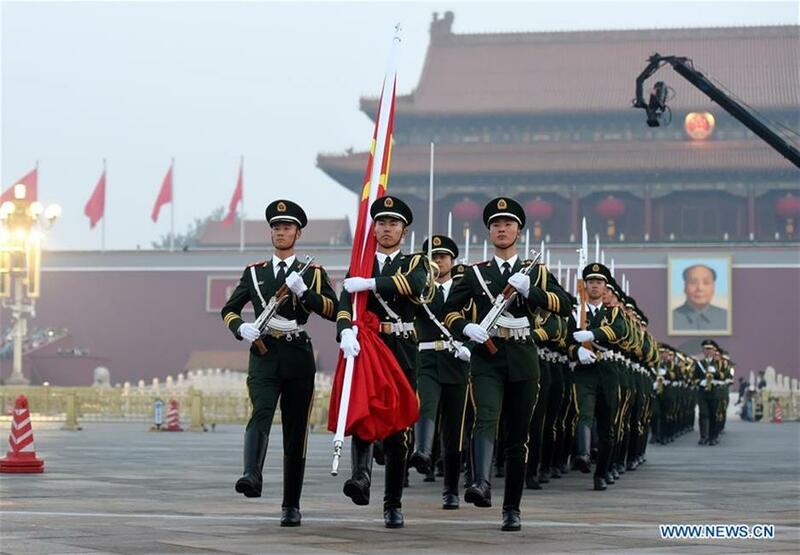 Sunday marked the 68th anniversary of the founding of People's Republic of China. At 6:07 a.m., the national flag was escorted by guards into the square. The crowd stood in silent as the national anthem "March of the Volunteers" was played, and the five-star national flag was raised. When the flag spread out at the top of the flagpole, 10,000 Peace Doves were released into the sky. At the backdrop was a 17-meter-tall giant display in the shape of a floral basket, which holds flowers and fruits such as persimmons, pomegranates, apples, peonies and Chinese roses. It symbolizes a thriving and prosperous country. Watching the national flag raising ceremony at the Tian'anmen Square has been a way of Chinese celebrating the National Day. Some joined the gathering for sightseeing, and others came to express the feeling of patriotism. "We really got emotional when we sang the national anthem on this occasion," said Yang Yuanyang, a freshman from the Beijing Information Science and Technology University. According to China's national anthem law which took effect on Sunday, the national anthem can only be allowed at formal political gatherings, including flag raising ceremonies and major celebrations. The National Day is celebrated with a week-long holiday, while the Chinese traditional Mid-Autumn Festival or Moon Cake Festival,featuring family gathering, falls on Oct. 4 this year. Major parks in Beijing have been decorated with around 1.6 million potted flowers of 150 different species, according to Beijing Municipal Administration Center of Parks. Traffic information from the Ministry of Transport showed that traffic on highways in Beijing, Tianjin and Shanghai became heavy from 6 a.m. on Sunday morning, as holiday goers rushed to scenic spots. On Sunday, the scenic area of the landmark Badaling section of the Great Wall in northern Beijing was opened earlier than normal days to welcome holiday tourists. Badaling, where the oldest sections of the Great Wall have been dated back to the Northern Qi Dynasty (550 - 557), is decorated with over 100,000 flowerpots to add the festive air for the National Day. The ancient Beijing-Hangzhou Grand Canal opened its first transport hub on Sunday, marking the start of a modern transport era on the 2,500-km manmade waterway, the longest in the world. With the hub in operation in Hangzhou, capital of east China's Zhejiang Province, passengers can travel by boat for sightseeing on the Grand Canal and conveniently transfer from water traffic to other road transport means. Over 1,000 km of the Grand Canal has been recognized as a world heritage site in 2014.